Congratulations William Castle on directing a Hammer film! What’s that you say? 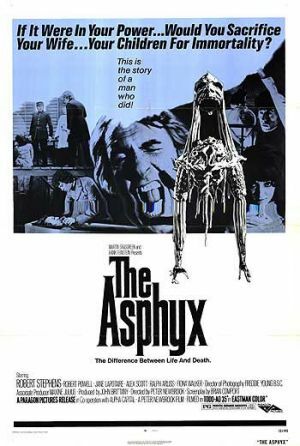 The Asphyx isn’t a Hammer film? William Castle already directed a Hammer film called The Old Dark House? Well, umm, let me explain the joke. The Asphyx looks, sounds and smells like a Hammer film even if it was released by some other studio and the concept of the movie is so gosh darned ridiculous and silly, that it rivals The Tingler. You still don’t get it because you haven’t seen The Tingler?! The premise of that ridiculous movie is that, when you get freaked out, you can isolate a creepy, crab-bug type creature called your “tingler” that grows on your spine and can have it physically removed and I guess watch it crawl around for no particular reason. Sound pretty stupid, right? Well, your “asphyx” (or Slimer from Ghostbusters) is essentially your soul, which apparently can be removed, isolated and trapped in a box and, as long as it stays in said box, you remain immortal. Once it’s set free, you die. The fact that I bought into the ridiculous premise is telling considering I gave the movie a grade of three out of four. And I would have given it a perfect score because, as the movie progressed, the story got more and more absurd yet totally enjoyable. But, sadly, they fucked up so badly that I had to drop it by a single grade. See, if your soul is captured and you’re 27 years old, then you don’t grow any older than 27. You don’t get younger either but you definitely don’t get older. As a result of this rule being established in the film, I couldn’t get past the major continuity gap which manifests itself in the epilogue, where we see the main character as a really, really old man, see. The plot of the film concerns a scientist named Sir Hugo Cunningham (Robert Stephens), who makes no bones about using the Dickensian-level, impoverished people for his twisted experiments where he lets them die and, as they die, he captures their “asphyx” in a box – which makes me thing the creators of Ghostbusters might have borrowed the capturing ghost concept, not to mention that the “asphyx” looks like Slimer – in an attempt to immortalize them; apparently having your soul torn from your body is extremely painful as one person took to throwing acid at the doctor while he attempted to remove this “asphyx.” A few other things happen along the way, such as the romance between the adopted Giles Cunningham (Robert Powell) and desired bride to be and daughter of Sir Hugo, Christina Cunningham (Jane Lapotaire). Unsurprisingly, as the story progresses, Sir Hugo gets progressively more insane; going from well-meaning oddball to crazy nutjob, leading to one of the most, “woa, WTF moments” I’ve seen in a long time involving a guillotine and the doctor’s daughter. “Don’t worry honey, it’ll work out just fine.” And, given the concept of the movie, it SHOULD have buuuut…. As I mentioned, the movie looks and feels like a Hammer film; from the gothic, old fashioned laboratory set pieces to the hilariously hammy acting but damn if I wasn’t entertained by the whole thing. Again, great movie with one annoying continuity gap.